This elementary fantasy is a wonderful easy read for everyone who loves fairies, like we do at our house. My 8-year-old Groovy Girl makes fairy water every other day (or so it seems) with markers, lots of water, and tiny jars. The result is sparkly, multi-colored water (think pinks, oranges, sea green) by putting a small (picture the mess in my upstairs bathroom sink) amount of water into the teeny, tiny jars (mini marmalade jars), then sticking a marker tip into the water, and watch the color flow into the water. Magically, the marker is not permanetely damaged through this creative process. She sets these jars on her windowsill, for fairy purposes. I haven't figured out why or what fairies do with this water...it just is what it is. 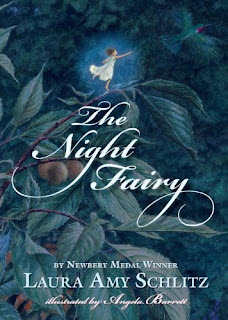 The Night Fairy is an adventure starring Flory, a young night fairy who at three monthes old has her brand-new, beautiful wings snapped off by a blundering bat, swooping through the night. She's left in a sweet, gray-haired human's backyard and has to learn how to survive without flying. Luckily, this human loves animals and is constantly putting treats out for the birds. Flory befriends a squirrel, Skuggle, who is always hungry and the two learn to help each other. She finds other animals along the way; both friends and foes, even helping a hummingbird escape a spider. She uses her mind and her limited use of magic to defend herself and find out more about the world around her. This imaginative little book is filled with great adventures that many fairy-loving young humans will love. The end of the story paves the way for, hopefully, more escapades with Flory. Flory would probably love to live in my daughter's room with all the fairy water there for her. Laura Amy Schlitz won the 2008 John Newbery award for her book Good Masters, Sweet Ladies! Green Bean Teen Queen predicts it as a Newberry Dark Horse winner.